All-Channel Cloud Solution integrated with Microsoft Dynamics 365 powering digital transformation & automatic compliance across financial services, ecommerce & retail. SANTA CLARA/LONDON – 25th March 2019 –Solgari, the provider of All-Channel Cloud Communications Services, and SA Technologies, the global Microsoft Gold Partner for Dynamics 365, today announced their partnership to bring Solgari’s Dynamics 365 Omni-Channel Solution to SA Technologies Banking, Financial Services & Insurance (‘BFSI’) & Retail customers. As a global Microsoft ISV, Solgari partners with the leading Microsoft partners who are developing transformational customer cloud solutions. SA Technologies has a proven record of building highly scalable, world-class consulting processes that deliver tremendous customer results across BFSI and retail, including cutting edge cloud solutions built on Dynamics 365 – SA Technologies Microsoft Dynamics 365 Solutions . Wow customers by offering a seamless experience across all the digital communication channels. Provide your sales & support Dynamics 365 users a single view of all customer interactions across whatever channels are required. Automatic compliance around various regulations such as PCI DSS. Consolidate IT in the cloud, driving at least 50% cost savings. 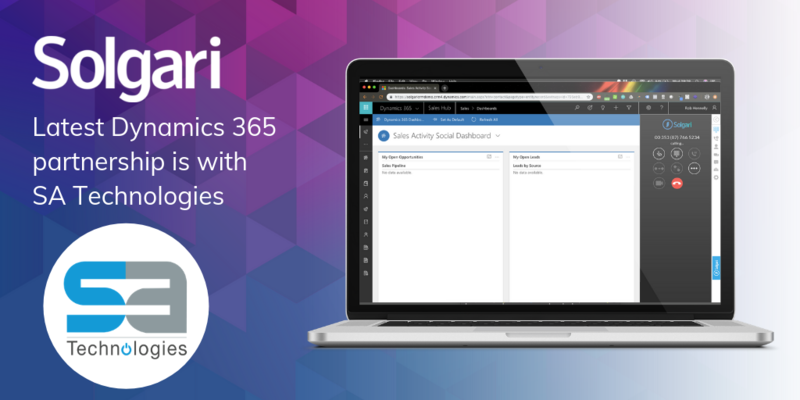 Immediate access to integrated Voice, Video, Chat & SMS communication channels within Dynamics 365 once the user logs in. Queuing, agent groups, skills-based routing. Record & archive all customer communications for compliance, regulation, training and data purposes. Search & retrieve any customer interaction, reporting and speech analytics. Local PSTN and Toll-Free Numbers. The solution is available for a 2 week trial on Microsoft AppSource: Solgari – the Dynamics 365 All-Channel Solution Microsoft AppSource or please contact raj@satechglobal.com for more information. SA Technologies Inc. is one of the few full-service providers which caters to almost all the industries. SA Technologies’ strong organizational skills, in-depth business process knowledge and technical expertise in implementation services including iOT project experience make them one of the unique partners who can achieve the business objectives for clients with maximum operational efficiency. SA Tech’s strength is in D365 Customer Engagement including PSA and FSA, Unified Operations (AX) and Business Central. SA Technologies (SAT) is one of the leading IT Consulting Companies based out of Santa Clara, CA and serving the clients for more than 16 years in North America, APAC, Middle East and India. We have a proven record of building highly scalable, world-class consulting processes that offer tremendous business advantages to our clients in the form of huge cost-benefits, definitive results and consistent project deliveries across the globe. With more than 700 employees at over 6 locations worldwide, we generated $ 25 million of sales revenues in 2018. For more information, please visit SA Technologies. 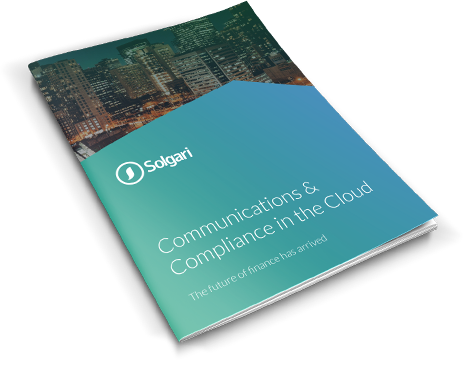 Solgari’s integrated cloud software service provides all the business communication channels – voice, video, chat, IM & SMS – while also including GDPR, PCI DSS & MiFID II compliant recording & archiving of all communications.